The below Ocellaris ClownFish profile is based on what I have learned and observed. They certainly are great little fish to keep and will add a lot of viewing pleasure to any aquarium. 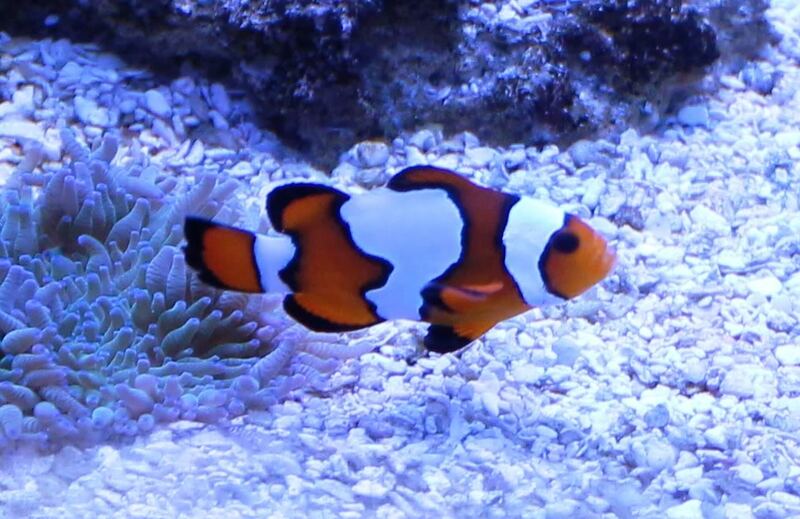 In my opinion, Ocellaris Clownfish are among the most popular and the most recognized fish in the hobby. 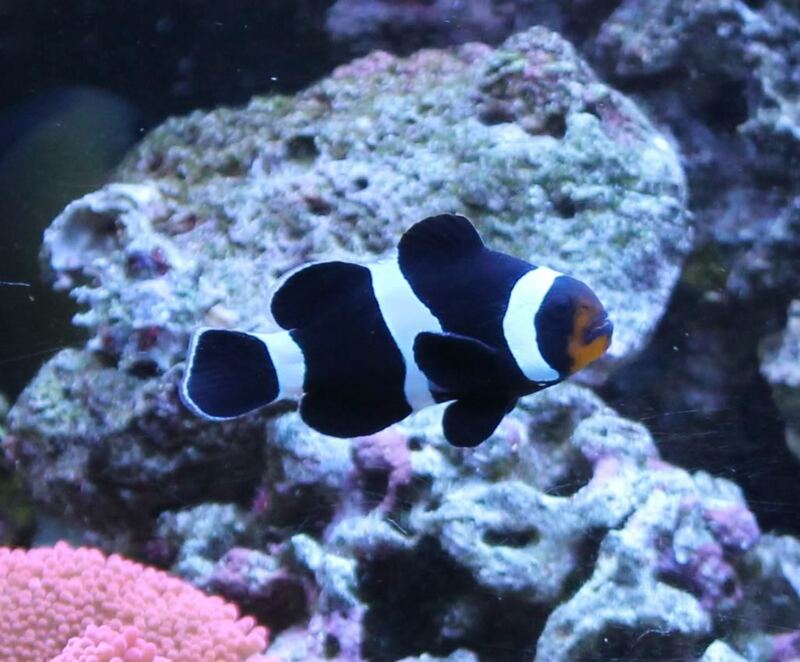 The most common Ocellaris Clownfish will have an orange body with 3 white bands separated by a thin black boarder. 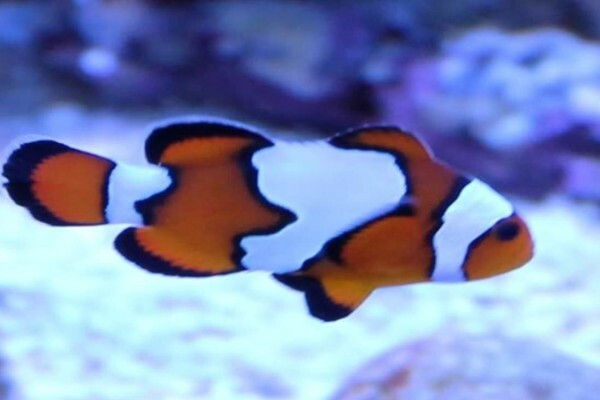 As these fish are very easy to breed in captivity, many companies have started breeding clownfish for sale in the hobby as well as developing selective breeding programs to produce a lot of different color and pattern variations. There are now hundreds of different variations of Ocellaris Clown fish to pick from. 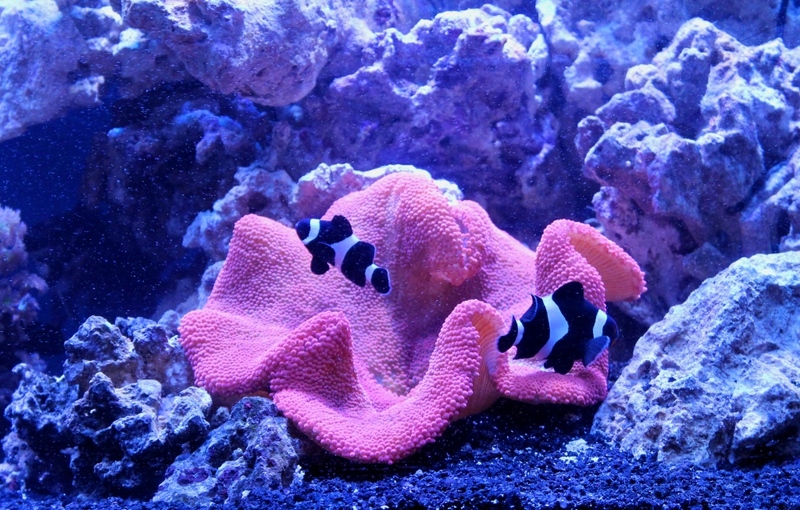 The below pictures are of a few types or variations of Ocellaris Clownfish that I have kept. 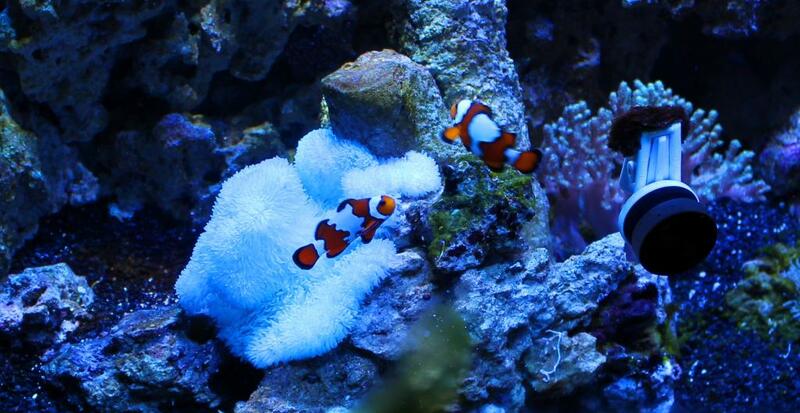 These clownfish are Domino Ocellaris which are a very new clown fish for me. The below pic was taken in while the fish were still at the store before I took them home and placed them in my QT tank. Clownfish are very peace fish to have in an aquarium. You can keep them with any other peaceful fish and with other clownfish. However, if you have a mated pair that has claimed an area in your tank as their own (or is hosting in an anemone), they will most likely become territorial and chase away any other clownfish that may come near their spot. I would suggest nothing less than a standard 29 gallon tank for these fish. Many other people would argue that clownfish can live in a 20 gallon tank. Based on my first hand experience with these fish, I would say that anything less than a 29 gallon will not allow them to actual naturally as they can be very active little fish. Do clown fish need an anemone? In short, they don’t need an anemone to host in order to happily live out their lives in your aquarium. 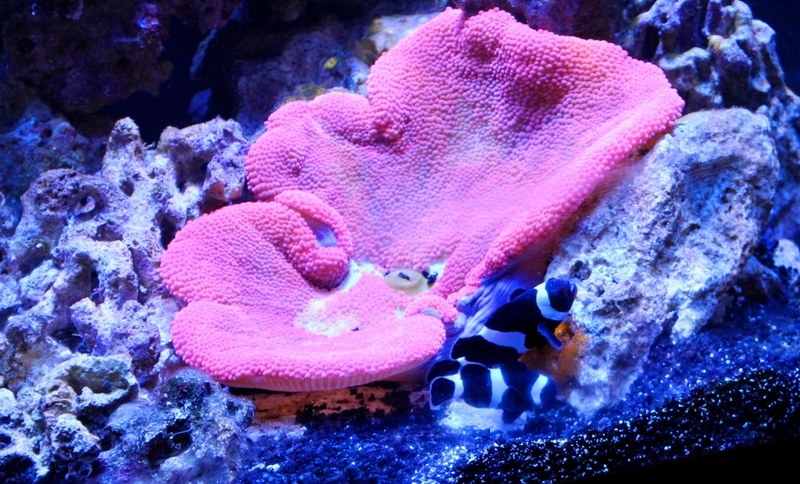 If you are keeping them in a tank without an anemone, then you should make sure the clownfish will have hiding spots to go to should they feel threaten. As clownfish are omnivores, they will eat almost anything you give them. A good variety of algae based as well as meat based foods would be best for them. Marine based flakes or pellets, with algae based marine flake or pellets along with the occasional offering of mysis or brine shrimp would be very good example of foods offer your clown fish. This is one of the easier marine fish to breed. All clown fish are born as males. Once a mated pair forms, the dominate fish will become female and grow noticeably larger than the male. As tank bred and raised clownfish are easy to come by in the hobby, I would always suggest purchasing tank bred fish over wild caught. The tank bred will be more accustomed to life in a aquarium making them hardier as compared to wild caught fish, and you will be supporting a more environmentally sound practice. 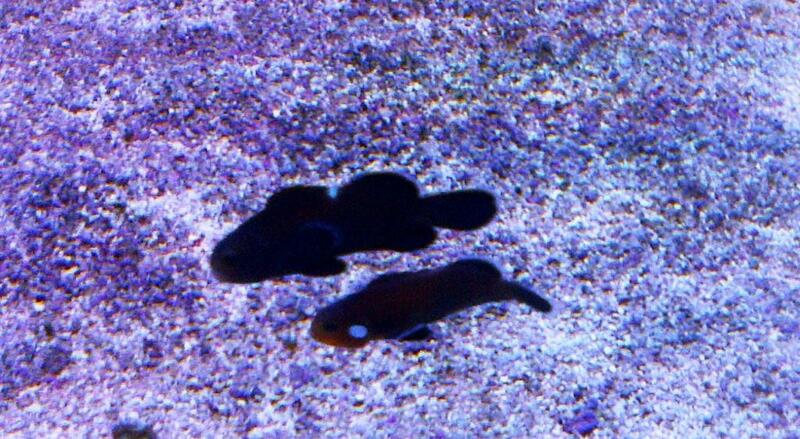 The below pictures are of the first spawning of a pair of black Ocellaris ClownFish that I have kept. A nice, no nonsense article, written in a way to highlight individual reef keeping issues. Coincidently, I have been involved in saltwater aquariums to some degree for 17 years as well! Prior to that I kept freshwater tanks for several years. I have had a mixture of successes and failures over the years, mostly due to my own failings. Some due in part to the pressures raising a family and economic pressures. I have also had to learn that everyone able to post on the internet their personal opinions as fact has caused frustration and failures for some entering the hobby. Coupled with unrealistic expectations held by some when viewing spectacular reef photos, some have become discouraged and quit the hobby. Unrealistic because of underestimating the time, effort and expense required, as well accurate, proven, information needed for maintaining a healthy aquarium environment. I have come to appreciate the need to safeguard the oceans and the amazing life found there and the need to secure tank raised animals for our aquariums. If none are available, do without. Much has been done in the last 10-15 years in breeding many varieties of heretofore “impossible” to breed aquarium animals. Some animal I think should never be collected because of the pressure the ocean is under because of environmental issues, over fishing, etc. And some creatures to date have resisted in-tank reproduction. I have kept a haddoni anemone since 1997, that was purchased at a local lfs. It was in a dark corner of the store, In a poorly lit tank filled with green water. It was a pitiful looking thing, and my wife asked, “Can’t we take it home and save it?” 16 years later it is living in it’s own tank with 1 clarkia. (because both are anti-social with guest to their home!) I participated in a survey in 1998 re: keeping them in an aquarium: most died in less than year! Many marine biologists suggest they can live in the ocean for 100+ years. I am glad I bought and “saved” it, but I certainly would never recommend collecting and keeping them. Please, keep writing articles that stir interest in such an amazing hobby.